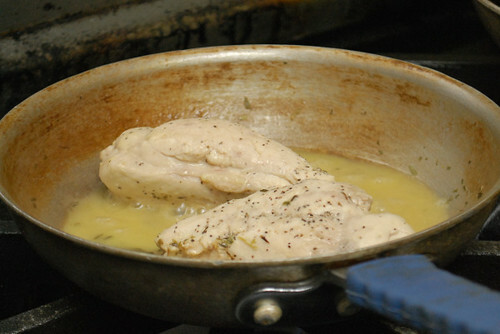 The moist heat cooking methods most often used with poultry are poaching and simmering. Poaching is used to cook tender birds for short periods. Simmering is used to cook older, tougher birds for longer periods in order to tenderize them. Poaching and simmering are similar procedures, the principal differences being the temperature of the cooking liquid and the length of cooking time. Poached or simmered poultry should be moist, tender and delicately flavored. Although the poultry is cooked in water, overcooking will cause it to become dry and tough. During cooking, some of the poultry's flavor is transferred to the cookin liquid, which can be used to make a sauce for the finished product. Young birds are best suited for poaching; boneless chicken breast pieces are the most commonly used parts. Older, tougher birds are usually simmered. Duck and geese are rarely poached or simmered because of their high fat content. When poaching poultry, it is especially important to use a well-seasoned and highly flavored liquid in order to infuse as much flavor as possible into the item being cooked. Either strong stock with a sachet or a mixture of stock or water and white wine with abouquet garni or onion piquet produces good results. The poultry should be completed covered with liquid so that it cooks evenly. However, if too much liquid is used and it isn't strongly flavored, flavors may be leached out of the poultry, resulting in a bland finished product. Poultry is often simmered in water instead of stock. A sachet and a generous mirepoix should be added to help flavor it. Typically, simmering birds results in a strong broth that may be used to complete the recipe or reserved for other uses. For best results, poultry should be poached at low temperatures, between 160 and 175 degrees. Cooking poultry to the proper doneness at these temperatures produces a product that is moist and tender. Simmering is done at slightly higher temperatures, between 185 and the boiling point. When simmering, do not allow the liquid to boil, as this may result in a dry, tough and stringy finished product. 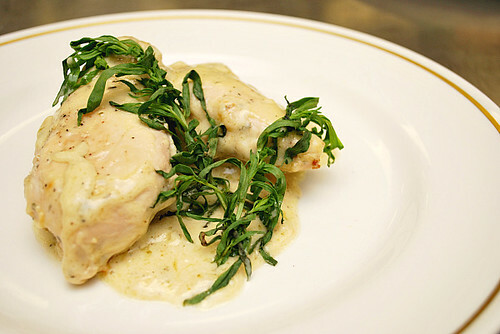 Poached poultry, whether whole or boneless, is cooked just until done. An instant-read thermometer inserted in the thigh or thicker part of the bird should read 164. Any juices that run from the bird should be clear or show only a trace of pink. Simmered poultry is usually cooked for longer periods to allow the moist heat to tenderize the meat. 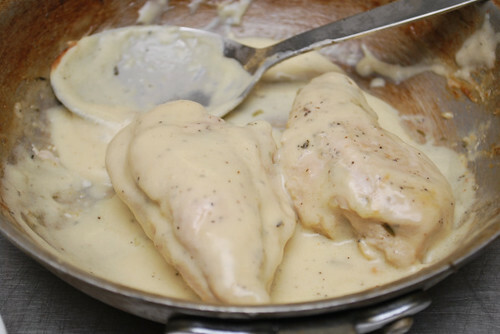 Poached or simmered poultry can be served hot or cold. The meat from these birds can be served cold in salads, served hot in casseroles or used in any dish that calls for cooked poultry. Poached items are typically served with a flavored mayonnaise or a sauce made from the reduced poaching liquid, such as a sauce supreme. Poultry is also often poached as a means of producing a low calorie dish. If so, a vegetable coulis makes a good sauce, or the poultry can be served with a portion of its cooking liquid and a vegetable garnish. Simmered poultry to be served cold will be moister and more flavorful if it is cooled in its cooking liquid. To do so, remove the pot containing teh bird and the cooking liquid from the heat when the bird is still slightly undercooked. Cool the meat and broth in a water bath. Once cooled, remove the meat and wipe off any congealed broth before proceeding with the recipe. Cut or truss the item to be cooked as directed in the recipe. Prepare the cooking liquid and bring it to a simmer. Submerge teh poultry in the cooking liquid, or arrage the items to be poached in an appropriate pan and add the poaching liquid to the pan. 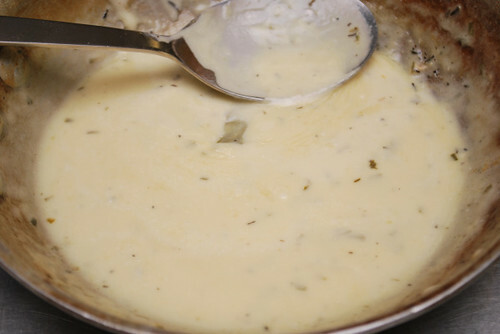 Poach or simmer the item to teh desired doneness in the oven or on the stove top. Maintain the proper cooking temperature throughout the process. Remove the poultry and hold it for service in a portion of the cooking liquid or, using an ice bath, cool the item in its cooking liquid. The cooking liquid may be used to prepare an accompanying sauce or reserved for use in other dishes. Trim any rib meat and fat from the breasts. Cut the breasts into two pieces, removing the strip of cartilage that joins the halves. Select a pan that will just hold the breasts when they are placed close together. Rub the pan with half of the butter. Season the chicken breasts with salt and pepper and arrange them in the buttered pan, presentation side up. Add the wine, stock, bay leaf, thyme and dried tarragon. Cut and butter a piece of parchment paper and cover the chicken breasts. 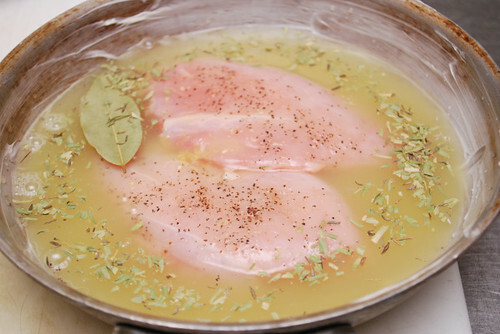 Bring the liquid to a simmer and reduce the temperature to poach the chicken. Make a blond roux with 1 ounce of butter and flour; set aside to cool. When the breasts are done, remove them from the liquid. 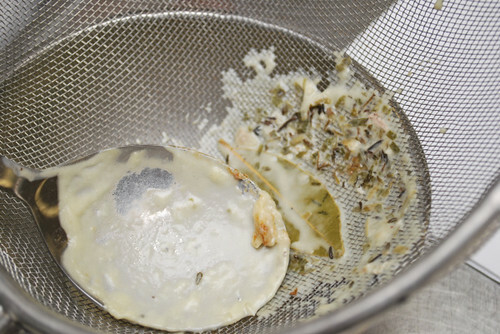 Thicken the liquid with the roux. Add the cream. Simmer and reduce to the desired consistency. Strain the sauce through cheesecloth and adjust the seasonings. Serve each half breast napped with approximately 2 fluid ounces of sauce, garnish each portion with a spring of fresh tarragon.